If gods truly walked the earth, then one of them must be guitar god Carlos Santana. But this time, this rock god will go on a colossal tour de force that will give us mere mortals the golden opportunity to be blown away by his presence and masterful guitar skills just like he did 50 years ago at the Woodstock stage. And yes, Santana's "Supernatural" Tour is coming to these shores. 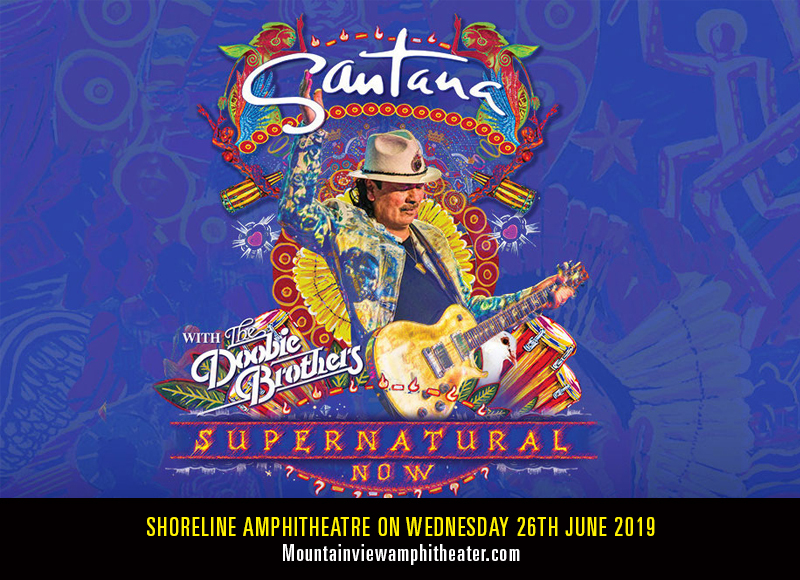 Waves of Santana's transcendent body of work will hit and rock the Shoreline Amphitheatre on Wednesday 26th June 2019. Excitement is truly an understatement. Adding on to the magnitude of exhilaration is yet another supporting act with an iconic stature — none other than The Doobie Brothers! Expect an onslaught of multi-generational fans raring to seize the momentous experience unfold right before their very eyes. Tickets will definitely be in high demand. What are you waiting for? Get your tickets now! Carlos Santana is smooth personified. His mad guitar skills are not of this earth. This rock god has blessed our musicscape with guitar-driven songs that will never die; certified timeless, everlasting hits. His staggering impact in music is marked by milestones, and this is the perfect time to celebrate not one, but two of his most important breakthroughs that shaped the course of music. One –the 20th anniversary of the release of the Grammy Award-winning album Supernatural. Two –the 50th anniversary of the legendary band’s performance at the 1969 Woodstock music festival. How could anyone top that? So what could his multitude of followers expect from this nine-time Grammy Award, three-time Latin Grammy Award winner, Rock and Roll Hall of Famer, and Rolling Stone's 20th greatest guitarist of all time?